- Players start with 20,000 in chips and the levels are 45 minutes in length. - $100 for every player you eliminate. - Players start with 8,000 in chips and the levels are 40 minutes in length. Thomas Sin Wins the $400 Limit Hold 'em Event! 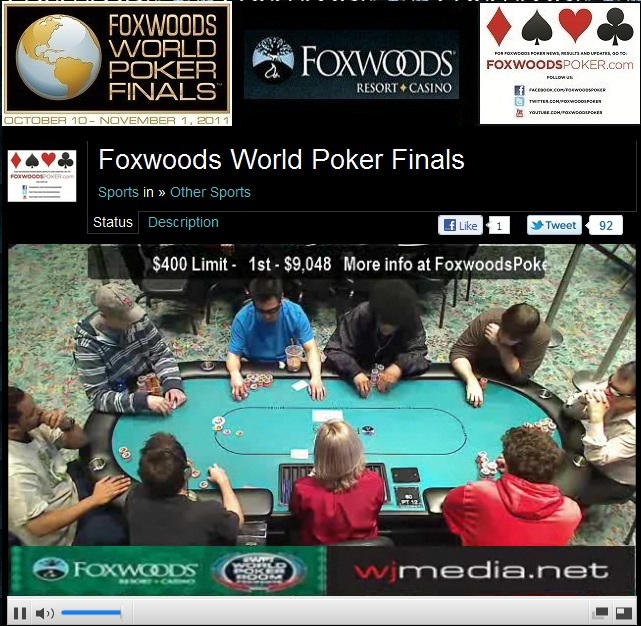 Thomas Sin just won the $400 Limit Hold 'em event at the Foxwoods World Poker Finals. He takes home $9,048, the World Poker Final Trophy and the watch! $400 Limit Final Table Streaming Live! The final table of the $400 Limit Hold 'em event is now streaming live. Just click "Watch LIVE Video" at the top of the page. We had a total of 379 players in the $400 NLHE Deep Stack event at the Foxwoods World Poker Finals. $400 Deep Stack Event About to Begin! The $400 No-Limit Hold 'em Deep Stack event is about to get underway. Players will start with 20,000 in chips and the levels are 40 minutes in length. Live streaming will begin later today with the $400 Limit Hold 'em Final table.